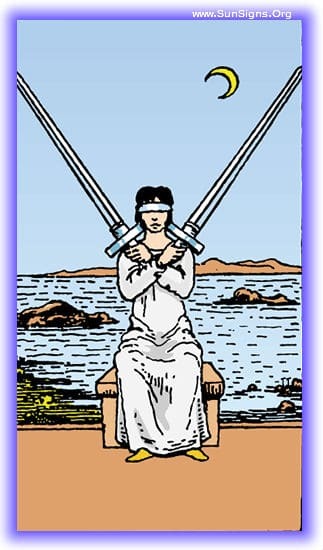 The Two of Swords in the Minor Arcana are presented as blindfolded woman with two swords crossed in front her. It represents a forking of the path, and confusion in which way to go. The woman is in a stalemate, with no idea of which choice is going to best serve her, and as such is paralyzed in inaction. They also represent perfect balance, as the swords are the same size and length, and held at exactly the same angle. A difficult decision stands before you, needing to be made. It is a difficult one, and logic and intellect are needed to help deduce the proper way to go. There is a tendency to try to avoid making the decision, knowing that there’s a peril to choosing wrongly. Having found the proper information lacking, there is a stalemate, all of this pointing to a need to divert from traditional paths of thinking to arrive at a decision. Let us talk about the elephant in the room. It’s been there, and you’ve been stalling on the matter of discussing it. Whatever has held you in suspense has also held this situation not being resolved, only a committed decision to act will solve this problem. You’re stuck, and you know it. This tarot card shows that there is a decision coming down the path in front of you, and you are very aware that it is both present, and needing to be made. The biggest difficulty you’re facing is that both answers carry either equal merit, or equal peril. This card appearing is warning you to take the time to apply logic and intellect to solving the problem, don’t jump. The situation you’re currently involved in is about to come to a head, and when it does, you’ll be called on to make an important decision. In preparation for this you should begin gathering your data now, so that you’ll be ready to make the best decision you can when the time comes. You find yourself between the proverbial rock and a hard place, with neither option available to you being a good one. The amount of information you have about either path is simply overwhelming, or completely absent, neither extreme being helpful to you at all. Worst of all, you feel utterly stuck, and the solution may actually be to not make the decision in this case, but to pass it off to someone else. 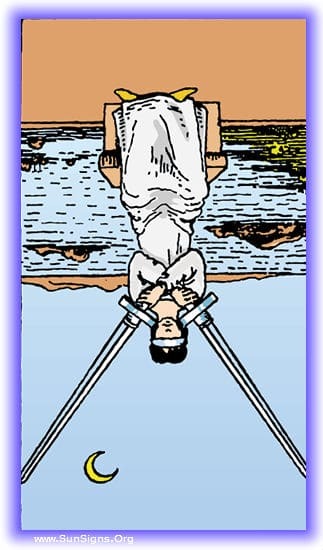 The Two of Swords in this position shows that you’ve had to make a hard decision in the past few months, and now you’re living with the consequences of that decision. Rest assured that both decisions would have led to difficulty, but either way you’re having to deal with the results of your decision now. You’re being called on to make a decision you don’t have any need to be involved with. The main role you have to play is to try to help them to make a decision amongst themselves, if it looks like you’re not going to be able to cooperate, get yourself out of the situation and let them deal with the ramifications of their non-cooperation themselves. The tension is mounting, and the confusion is getting worse. You’re trying to avoid it, but the situation you’re in right now is going to come down to that decision you’re not wanting to be forced to make. Start thinking on it now, there’s no way around it, you will be called on to make the hard choice.